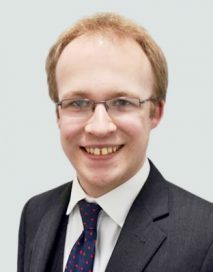 James joined Dere Street Barristers in 2017, having successfully completed a common law pupillage in chambers. He has particular interests in property disputes and commercial dispute resolution. Advising on and drafting particulars for a claim for injunctive relief and damages arising from an ex-employee leaving a company and setting up in direct competition using a customer list which had been stolen from his former employer. Advising a defendant company which purchased contact details from a third-party company which had allegedly failed to adhere to pre-GDPR data protection rules and was facing a claim for damages. Advising the company on inclusion of the third party as a Part 20 Defendant to a claim for a contribution and/or indemnity. Successful application at a CCMC for an “otherwise” order / relief from sanctions pursuant to CPR 3.14 when the deadline for filing a costs budget had been missed for no good reason. Prior to pupillage, James worked in the commercial property department of a solicitor’s firm where he gained experience in matters ranging from residential conveyancing to high value commercial transactions between landowners and property developers. Advising the owner of a long-leasehold apartment on what action can be taken to remove a rogue director from the board of a management company where the company was not properly discharging its functions. Advising on liability and quantum in a proposed claim against a housing developer for losses arising out of defects discovered in a new build property which fell outside the scope of NHBC protection. Drafting a defence and advising a property developer in a misrepresentation and breach of contract claim made by a house purchaser who claimed the construction of social housing next to their property was concealed from them at the time of purchase. Advising the owner of a leasehold apartment as to the legal status of their allocated parking space and whether the management company were entitled to use the space as a storage area. Assisting senior counsel in advising on the sale of a farm, which was held on trust, to property developers with the added complication of an overage covenant relating to part of the land. James regularly represents clients on both sides of personal injury matters from the small claims track to the multi-track. He has experience in cases involving accidents at work, occupier’s liability, holiday sickness, the Highways Act and the Animals Act, and accepts instructions on a conditional fee basis where appropriate. When he is not in court, James has a busy paper practice and enjoys advising in writing on all aspects of liability and quantum, including contributory negligence. He recently advised on quantum in a case where the claimant’s teeth were significantly damaged as a result of the defendant’s negligence, where ongoing dental treatment and surgery was required for the remainder of the claimant’s life.